Nowadays governments everywhere are making sincere efforts to educate young ones. This is to make sure that not a single child anywhere is denied of the opportunity to learn. It is because of the scholarships and grants which are available to those who are from financially weak backgrounds, that the literacy rate of both men and women has gone up considerably in the recent past. Millions of students apply for scholarships, but only a few manage to receive them. Given here are good tips for scholarship interview so that you are able to get the help which you need in order to build your future. Bright students who do well in their academics are given scholarships for their future studies. They act like aid for them. But not all are so lucky to get them so easily. Students who are qualified to get scholarship need to attend a scholarship interview organized by a scholarship board. This process is mandatory to know well about your character, personality and attitude. They would also make sure that the scholarship aid is getting to the right fit student. 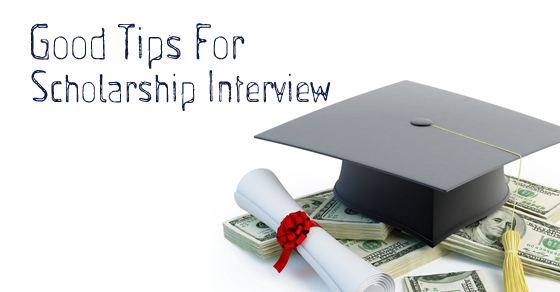 The following mentioned are few best tips to remember when attending an interview for the scholarship. If you do not make some effort on your part, then you cannot think that you will be able to get the scholarship. Being analytical while answering plays an important role in your selection. Keep in mind that every institution or university will try to procure the best of students, so being informative can only help you on your way to success. For this, you need to keep yourself updated on everyday affairs taking place in your country and worldwide. If the examiner, through your answers get the hint that you are unprepared, then he is certainly going to think that you are treating this entire exercise as a big joke. While answering a question quickly gather up the points that you would like to include in your answer, in your mind. It is alright to take your time before you answer. Do not say something which is inappropriate and unprofessional as no institution would like to select candidates who do not know how to conduct themselves in a proper manner. If you waste the opportunity which has been given to you, then there will be plenty of others who will be willing to grab the opportunity with open arms. So ensure that at no point in time, you are taking things for granted. As mentioned above, coming prepared will help you immensely. It is vital that you are well aware of your subject and in addition to this, it is imperative that all your family details are on your fingertips. It is only when you are familiar with the facts that you will be able to give a satisfactory answer. The examiner expects you to have all the answers registered in your brain. You must show that you are willing to do whatever it takes to bag this scholarship. At no point in time in the course of the scholarship interview should you come across as fake or not genuine. When you come to the interview, you must let your words come straight from the heart and you must let your true personality shine forth. You must realize that these interviewers are skilled professionals who can instantly make out when someone is hiding the facts and not speaking in an honest manner. If you utter some lies in the course of an interview and your lies are caught out, then be rest assured that the opportunity has been lost. When speaking in the course of the interview, ensure that your answers are stemming from the passion for the subject. The interviewer is not merely going to ask you about your family life, he or she is going to question you on the subject which you are applying for. Show through your words that your love for the subject is rather deep and that your passion for the subject will really help you to achieve success. Say that you have faced a lot of struggle in your life, but your love for the subject has always kept you occupied and positive. When appearing for an interview, confidence is the key. Appearing for a scholarship interview is no exception either. You must ensure that in the course of the interview, you speak in a confident manner and are expressing yourself coherently. At the end of the day, you would not want to be selected on the grounds of pity. The interview phase is very important indeed in deciding whether or not you will be granted the scholarship, so ensure that you use the chance wisely and impress the interviewer with the manner in which you speak as well as conduct yourself. It is truly admirable to have a student who is opinionated and can hold on to his point of view, no matter what. But that certainly does not mean that you act in a bold and brazen manner. At no point in time should it seem like you are someone who is very overconfident. The moment you act in a smug or complacent manner, that will truly set a very bad impression in the mind of the person who is taking your interview. No matter what your personal achievements are, speak in a humble manner. Preparing well for the interview is the best way to get through it. Now, this stands as a tried, tested and key rule which one must follow. And also this works for any kind of interview. Another step is to try mock interviews, be prepared and ask your family or friends for a mock interview. This helps you in rectifying your mistakes, gain confidence and overcome nervous breakdowns. Go through all the common questions asked in a scholarship interview. You can find a lot online along with best answers suitable. The following mentioned are a few interview questions for scholarships. Applicants have to be honest and open about their family background. Do not conceal any important piece of information that you feel is necessary to tell. Given the fact that you are applying for a scholarship, such questions are surely going to be asked. So be willing to present a clear picture of how and where you live as well as how many people live in your family. Do not be ashamed of where you come from; be proud of the fact that you are trying your best in order to improve yourself. There is sure to be a question regarding your family income. So know exactly what the figure is and state it without feeling bad in any way. There is no reason to add or subtract any amount to it, just say it as it is. Make sure you are carrying all the relevant documents to support your statement as they will not be taking your words at face value. Ensure that you make no mistake when quoting the figure as it is based on this very figure that they will judge whether or not you are eligible for the scholarship. A mistake at this phase could cost you heavily. Chances are that you will be asked by the interviewer, why do you want to pursue this very subject, knowing well that you cannot afford the course. He or she might go so far as to tell you some cheaper courses which you can opt for. However, it is important to note that this is merely a test. No matter what is told to you, you must not show that you are unsure about what you want. Let it be communicated to the examiners that, you will find a way to pursue this subject which you love so much. Interviewers ask the person applying for scholarships a variety of questions. The students must be prepared for any question which comes their way. Why do you think that we should give you this opportunity as opposed to all others who have also applied for it? Giving a proper answer to this question could really seal the deal for you, so ensure that you give a proper answer which is bound to leave a very lasting impression in the mind of the person who is interviewing you so that he is convinced that you deserve the chance. The scholarship process is rather complicated and it is natural to have some questions. Asking some good questions in the course of your interview will really show you as someone who is rather analytical and curious. All institutions like having students who have the guts and ability to ask smart questions. So you can ask about the percentage of scholarship which is offered to students. The better your standard of questions, the better will be the impression you will create in the mind of the interviewer. There is no harm in asking direct questions like this one, provided you do so in a polite manner. So if you want to know what your chances are then do not shy away from asking the question and inquiring just what the odds are of you getting an interview. If your chances are good, then you can go home feeling a little happy and content. One of the worst things you can do is pin all your hopes in one place. Ensure that you just give your best but do not instantly start building castles in the air post the interview. Chances are that the interviewers are going to inquire about what other things you are interested in, in addition to your studies. If you are someone who is good in co-curricular activity as well then that certainly gives you an edge over everyone else. It shows that you are someone who is an all-rounder and will truly be able to contribute to the institution in a positive manner. Things, like being good in sports, debating skills, creative writing abilities and even an artistic bend of mind, will really set you apart from the others who have applied for the same scholarship. In this day and age, without money hardly anything is possible. So if you have come from a financially weak background chance are that you have to face a considerable amount of hurdles while growing up. This is a very popular sample interview question which is asked to the applicant. It is important that you figure out what you are going to say before simply blurting out an answer. So be sure to answer in a proper manner, what has been the biggest challenge which you have faced in your life. If you have faced the obstacle without fear in your heart and eventually overcame it, that will assure you as someone with character. This is another question which is often asked by the interviewer “Is there anything which you would like to share”. It is advisable that you use this time in a wise manner and give a good answer which will really be able to win over the interview. At no point in time should you act in a needy manner, but simply say that your financial condition is the only thing which is standing in the way of you achieving your dreams. What is the reason to choose this school/College? How do you want to make use of this scholarship money? Are you an active participant in extracurricular activities? A scholarship interview is not as hard as you might think it is, all you have to do is prepare on yourself thoroughly. It is only after you put in your sincere efforts will you be able to emerge from the interview with flying colours. Keep in mind all that you have learnt and no matter what, you must ensure that you are always acting in a respectable manner. Scholarships are granted only after an intensive screening purpose, it is for this reason that you have to show that you are someone who is truly deserving and would never waste the opportunity which has been granted to you on a golden platter.